Flaky, light, and airy with a touch of buttery olive oil and Parmesan cheese. 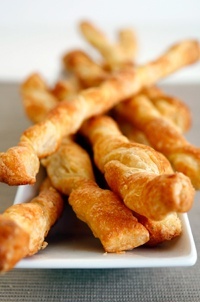 These twists are super simple since they are made with store-bought puff pastry. Lay the puff pastry out flat and rub with the cut sides of the garlic. Brush the pastry with the olive oil and sprinkle with coarse salt. Next, cut the pastry into 12 even strips, about 1-inch thick. Sprinkle the strips with the grated Parmesan. Twist and place on a baking sheet lined with parchment paper. Bake for 8 minutes or until puffed and golden.